Some magickal folks think that making spell kits for sale is a bad idea, and that no occult shop should sell spell kits, because then "anyone can use them." We at Lucky Mojo think that if the ingredients and the magic spells contained in spells kits are traditional for use in hoodoo rootwork, then it is a great idea to offer spell kits for sale. People often ask, "Do spell kits really work?" It is our experience that spiritually gifted people with no prior magical experience can actually put more raw energy into their ceremonial rites than paid practitioners will, especially if the purpose of the spell kit is to work love magic, money magic, or protection magic. 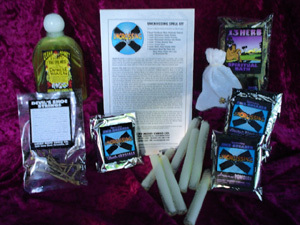 If you have never tried to cast a love spell or money spell before or performed a cleansing spell, unjinxing spell, or protection spell, then think of Lucky Mojo spell kits as a way to test your own powers of magick. If you fail, you can always hire a rootworker -- but if you buy a spell kit and use it with good results, you will have added some very powerful knowledge to you personal spiritual repertoire. You will also have saved a LOT of money, because the cost of a hoodoo spell kit is generally only a fraction of the cost of hiring a conjure practitioner to cast the spell for you. 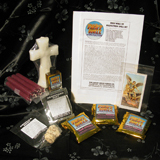 The picture above shows the packaging of Lucky Mojo brand spell kits for four typical hoodoo spiritual jobs or magical undertakings: Break Up is said to cause people to quarrel, fuss, fight, separate, move away, or divorce. Uncrossing, an extremely popular formulas, is used to take off crossed conditions, clear away enemy tricks, dispel evil spirits, break jinxes and hexes, and free one from curses. Money Drawing is used by those who wish to increase their income through business, payroll, gambling, gifts, or any other source of income that will enlarge their bank account and fatten their wallet. Fiery Wall of Protection provides a flaming wall of protection from tricks or messes that may have been put down for you by an enemy, and also protects from hostile spirits, demons, and the castings or sendings of the agents of evil. Lucky Mojo labels are adapted from vintage packaging and in many cases the images are as traditional as the ingredients themselves. 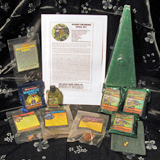 Order Spell Kits from the Lucky Mojo Curio Co.